West Bretton is proud to have gained the ‘Eat Well Award’ for its provision of nutritious, healthy food at lunchtimes. This award is an initiative of the 'Change 4 Life' programme. We appreciate the importance of your child eating a well-balanced lunch that they enjoy, and promote healthy eating as part of our curriculum. Miss Kaye, our catering assistant, works hard liaising with ISS Education, our school meal provider, to ensure that the children enjoy their school lunches. As a result, over 80% of our children eat a school lunch with the rest bringing lunch boxes. Children choose their main meal in the morning, which means they are guaranteed to get what they select. Every day there is a choice of four mains - including a vegetarian option - and three desserts. In addition to this, there is a salad bar with homemade bread. The menu runs on a three-weekly cycle and we have both a summer menu and a winter one. Our meals are cooked at Hendal primary school and are brought up fresh and hot every day. Children who have packed lunches are encouraged to bring a well-balanced, healthy lunchbox. Fresh water is available for all children on the tables and staff encourage the children to drink it. Our lunchtime assistants - Mrs Bilton, Mrs Wills, Miss Austin, Mrs Finnegan and Mrs Costello - supervise your children and ensure that they eat a sufficiently balanced meal. 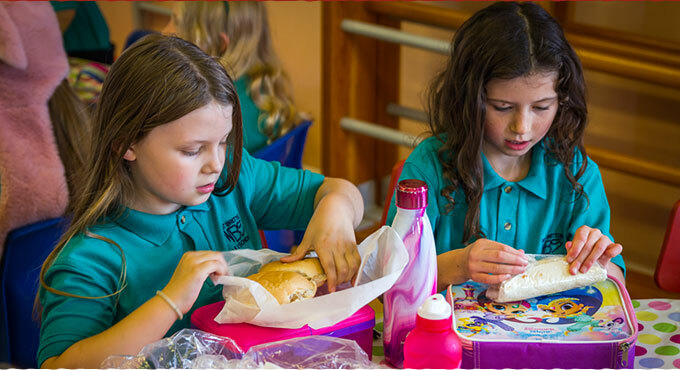 From September 2014 all children in Upper Foundation Stage, Year 1 and Year 2 are entitled to a free school meal as part of the new government universal meals initiative. Children from Years 3 to 6 have to pay for their meal unless they fit the free school meal criteria. The cost of a school meal is £2.05 a day and parents have the option to pay either weekly or on a half-termly basis. Please look at the link below to see if you fulfil the free school meal criteria. It is important to inform school if this is the case as your child will also be eligible for additional funding to assist them in their learning.